As we await the arrival of Star Wars: The Force Awakens in December, I’m examining some of the Star Wars comic books and novels of the past. Today I’m looking at issue #89 of the original comic book series published by Marvel. From 1977 to 1986 Marvel Comics published an ongoing Star Wars title. Marvel’s writers & editors were basically working in a vacuum. They had no idea what was coming in subsequent movies, they weren’t able to explore the era before the first film, and they had various restrictions placed on them as to what the characters could do. The result was some comic books that, by today’s standards, are quite odd. Despite all of that, there are some very good stories that appeared during the first Marvel run. One of these is “I’ll See You In The Throne Room” from issue #89, published in November 1984. It is written by Ann Nocenti, illustrated by Bret Blevins and edited by Louise Simonson. It is shortly after the Battle of Endor. The Rebel Alliance is working to topple the now-reeling Galactic Empire. Luke Skywalker is on the planet Solay, assisting the local cell of the Rebellion to overthrow the Imperial-allied government headed by the monstrous King Blackart. The revolution is successful, but its leader Raggold is mortally wounded. Raggold tells Luke and the beautiful Mary that this is the work of a traitor, but he dies before he can name the culprit. Luke is ready to seek out the murderer, but Mary restrains him, perceiving that his motivation is vengeance rather than justice. Luke, realizing revenge is a path to the Dark Side, reluctantly backs down. A week later Solay is still celebrating victory. Luke is concerned that the rebels haven’t begun to organize a new government, but Mary urges him to relax. Luke is about ready to do so, when suddenly the skies above Solay darken, filled with a massive fleet of Imperial spaceships. Mary is brutally cut down by a volley of blaster fire that accompanies their arrival. Luke realizes that the Empire used the Rebels to dispose of Blackart so that they could then take direct control of Solay. Over the next few days the planet descends into chaos as individuals attempt to grab up wealth and escape before the Empire solidifies its rule. The brooding Luke is obsessed with finding the traitor who sold them out, and with avenging Mary and Raggold. Luke finds himself teamed with Scamp, an urchin who tries to steal the Jedi’s lightsaber. Luke takes advantage of the pickpocket’s knowledge of the Solay underworld to search for clues to the traitor’s identity. Unfortunately no one knows anything. Scamp finally leads Luke to Braxas, an information broker who had a secret surveillance network installed in Blackart’s castle. Braxas agrees to reveal the traitor’s identity in exchange for the Jedi helping him escape from Solay. After Luke passes a harrowing test of nerves & skill involving a scorpion and a pair of chopsticks, Braxas gives him the surveillance tape with Raggold’s murder. Luke wonders if he truly wants to view it, fearful that once he knows who the traitor is he will not be able to resist killing him. Reluctantly playing the tape, Luke is shocked to see Raggold standing alone in the castle. The old Rebel reflects on how he has played the part of revolutionary perfectly, manipulating his comrades on behalf of the Empire. But now, having fought alongside the rebels for so long, Raggold realizes that he has come to admire his comrades and their cause. Consumed by guilt over his treachery, Raggold shoots himself in the chest. Now knowing the truth, Luke recognizes the futility of seeking revenge. Fulfilling his end of the bargain, the Jedi helps Braxas escape Solay. Departing the planet, Luke promises to one day return and continue the quest to liberate it from the Empire. I actually bought Star Wars #89 when it first came out in 1984. I was eight years old and it amazed me. It was an interesting examination of what could occur after Return of the Jedi, of how both the Rebellion and Luke would proceed following their biggest victory. This must have been the very first story I ever read by Nocenti. It was one of those comics that I read so often it fell apart. About 15 years ago I bought a replacement copy. Re-reading it as an adult, I found Nocenti’s story definitely held up. Nocenti effectively examines the aftermath of revolution. As difficult as it can be to defeat an oppressive regime, it is often even more of a challenge to replace it with a stable government that is better than what preceded it. Mary: This is just the beginning! Imagine, to be free to do and think whatever we wish! We’ll revive the arts! Luke: But the people will need help. They don’t know what freedom is! Mary: True, to ones enslaved so long, will they know what to do with freedom? I guess it isn’t so easy to be free. Luke: We toppled another figurehead. So what? It’s not enough to be against something. One must be for something! One of the themes running through the Star Wars movies is the cost of power, the weight of using it responsibly. Luke is in danger of being overwhelmed by the awesome abilities that he possesses, of repeating the terrible mistakes made by his father Anakin. Nocenti actually predicts a plot point that would appear two decades later in the prequels. As was seen in Attack of the Clones and Revenge of the Sith, Anakin became obsessed with preventing the loss of those he loved. His mother was killed, and he was terrified of his wife Padme also dying. Anakan wanted to be able to conquer death itself. His fear and his desire for greater powers enabled Emperor Palpatine to turn him to the Dark Side. Still mourning Mary’s loss, Luke has Scamp lead him to a member of the Rebellion who was in it solely for the money. Luke is certain that this man must either be the traitor or know who is, and the Jedi uses his powers to brutally interrogate him. It is apparent that the man known nothing, but Luke still contemplates killing him. He is acting exactly like his father, Darth Vader, would have in this situation. It is only when Luke remembers that Mary would have wanted him to be merciful that he reluctantly lets the man go. As his quest continues, Luke eventually becomes aware that his actions are motivated not by loyalty to the Rebellion, but by anger and vengeance. He realizes that he is in danger of turning to the Dark Side. The character of Scamp is interesting. The young pickpocket is like something out of a Charles Dickens novel. Despite Luke’s dismissal of the young boy as “a shallow petty thief,” Scamp ends up serving as the Jedi’s conscience in this story. Luke is genuinely surprised when he learns that Scamp’s larcenous activities are actually in service of supporting his impoverished family. Perhaps a weak point in Nocenti’s story is Mary, who is rather one-dimensional. It seems she is there to act saintly & innocent and then be killed off. Admittedly it is very difficult to develop a character who dies a third of the way through a 22 page story. I imagine that if Nocenti was writing this story today her editors would instruct her to spread it out over four or five issues. While that would have given her room to develop the characters, there’d nevertheless have been less dramatic punch if this story was padded out. The artwork by Blevins is fantastic. He utilizes dramatic, inventive layouts to tell the story. His inking is very detailed and rich. The pulp sci-fi / space opera designs for many of the characters, especially the hulking, brutal Blackart, are striking and effective. The sequence where Luke uses the Force to lift up the body of the dying Mary is genuinely powerful. Blevins brings out both the drama and the comedy of Nocenti’s story. Scamp is, naturally, a constant source of humor. Blevins’ depiction of Blackart is simultaneously terrifying and comical. The art Blevins did for this issue is especially impressive when you consider that he had only been working professionally for about three years when he drew it. 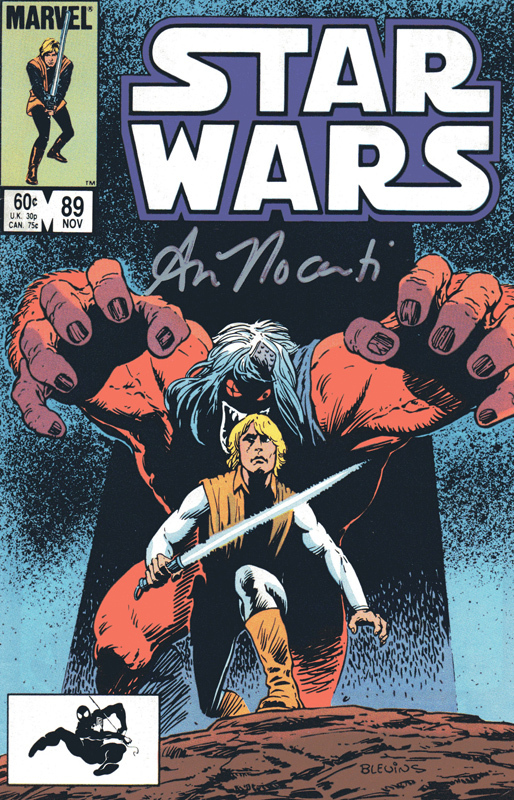 Simonson (under the name Louise Jones) was the editor of the Star Wars comic from 1981 to 1984. Many of the best stories to appear in the series were from that four year period. As with her editing on other Marvel titles, she got really great material out of the creators working on Star Wars. 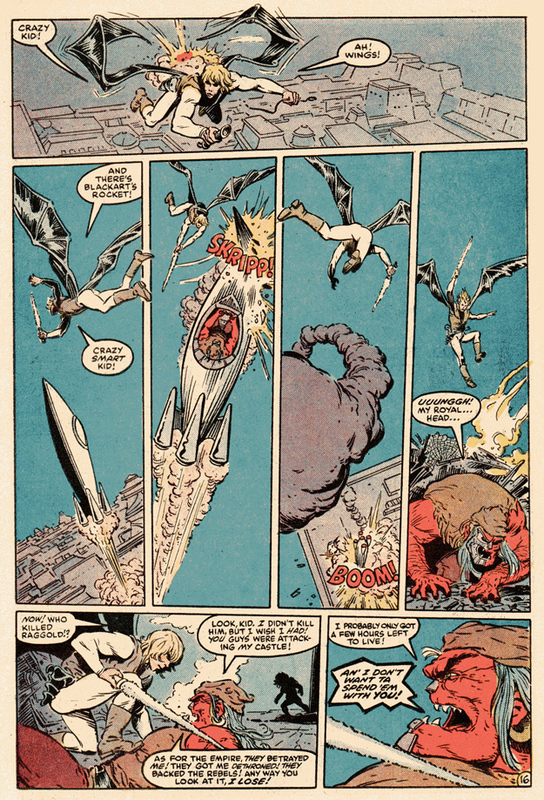 Simonson has always impressed me as the type of editor who identified the strengths of her creators and guided them in a direction that utilized those abilities, and who then stepped back and allowed them to tell stories without undue interference. Looking at Star Wars #89, it’s not surprising that Nocenti, Blevins and Simonson all went on to very successful careers in the comic book industry. They did excellent work on this story, both in examining the character of Luke Skywalker and his struggles with power & responsibility, and in delving into the complicated issues surrounding rebellion and freedom. I don’t have nearly your knowledge of comic book artists or the ability to visually appreciate their skills the way that you do, but I want to point out that Luke has a very interesting “look” in the above panels. Flowing blonde hair (years after Mark Hamill had gone full brunet) and high cheekbones. Looks very much like the androgynous lead singer of an early/mid ’80s hair band, with a tinge of David Bowie. I wonder if the artists of the time were just modeling their version of Luke over what style was “in” at that time, or if they had been instructed to make their Luke look not very Hamill-ish? I suspect this was a stylistic choice by artist Bret Blevins. Perhaps he felt that he was not good at rendering likenesses, and so decided to draw a Luke Skywalker that wasn’t a dead-on depiction of Mark Hamill but that still had the character’s personality. But I doubt it was an issue with rights because there were artists on the Marvel series who were VERY good as drawing photo-realistic depictions of the characters. Al Williamson immediately comes to mind. If you’ve ever seen the comic book adaptation of The Empire Strikes Back that he penciled for Marvel, it’s amazing how well he captured the likenesses of the actors.